Big-ticket items in your home like furniture and upholstery should be dusted and vacuumed regularly to prevent stains and discoloration. This is because regular cleaning is the only way to control the airborne cooking oils and dust that inevitably settle on these pieces. But what's the solution to a little one's chocolate snack that ended up sweetening the ottoman? Or grandma's makeup smudges on the sofa? 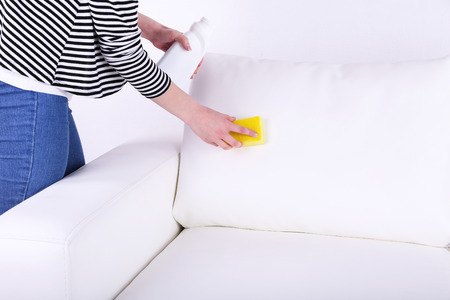 These furniture and upholstery cleaning tips can help. Blot on a small amount of rubbing alcohol. repeat until there is no more transfer of stain to white cloth or paper towel. If stain is gone, stop here. If not: Blot with a solution of 1 teaspoon dishwashing liquid or laundry detergent and 1 cup warm water. Work from outside of stain toward center. Rinse with damp sponge to remove detergent. Blot dry. Rinse with solution of 1/2 cup vinegar and 1/2 cup water. Blot dry. Brush when fully dry to restore texture. Blot with a solution of 1 teaspoon dishwashing liquid and 1 cup warm water. Blot and repeat. Rinse with vinegar solution of 1 cup white vinegar and 1 cup warm water. Blot dry. brush fabric when full dry. Blot milk and other dairy spills with a small amount of dry cleaning fluid and blot dry. Repeat until no stain transfers to paper towel. Wet fabric slightly and let set, damp, about one minute. Blot with paper towels. Repeat until no stain is evident on towel and blot dry. If stain is gone, stop here. If not, rub in a detergent solution of 1 teaspoon dishwashing liquid and 1 cup warm water. Repeat until no stain transfers to towel.